If you missed Part One of the race recap, you can click here. I'm pret-ty certain that's what country fans say when they're listening to country music. *Disclaimer: I have never witnessed Ann Marie saying anything like that, let alone dressing anything like that. When I first started running, TriGuy and I ran together on the mill at the gym. No wait. Side by side. On separate machines. Once we took to running outside, it was clear that his extremely long legs were going to be no match for my feminine boyish figure. I began to enjoy running with music. When we left off in PART ONE, we were heading toward Mile 11. I know this is well beyond the halfway point of the race. Just go with it. Throughout the race, Ann Marie had been doing an amazing job of talking to me. We were on an overpass when we came upon the Mile 11 marker, and we were passing a lot of restaurants that were along the water below. Naturally, Ann Marie began to tell me about all the different meals she has enjoyed at said establishments. Oh! I also forgot to mention that around Mile 9, we saw the 1st place marathoner run by us. A) He would finish double the distance I was running in less time than me. B) I was very impressed. C) Holy cow! There goes the 2nd place marathoner! Once we made it down the other side of the overpass, it was time for one more tunnel, because "running through tunnels is AWESOME! ", said no one, ever. 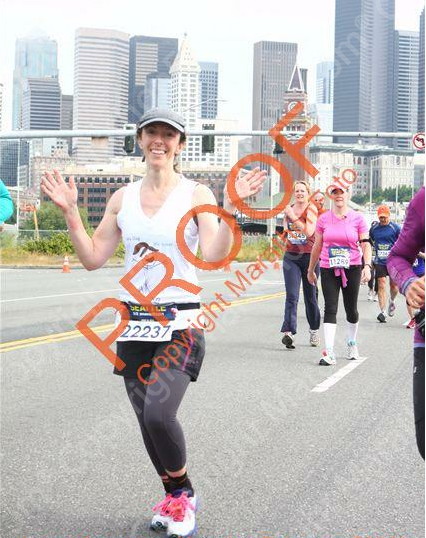 It was at that point that we saw the Mile 12 marker and Ann Marie told me it was time to leave it all out there. I started to speed up, and focused on running strong and fast. Ann Marie looked over at me and asked if I was okay. Yeah, I might have gotten a little weird. But I was in the zone. I ran those last 1.1 miles in an 8:42 pace, which included another hill at the very end. My average pace for the rest of the race was 10:11. It's cool. People brag on their blogs all the time. So, I would have to say that I think my weirdness paid off. We passed through the finish and then commenced the zombie chute-shuffle. We collected some free food and drinks. We then wandered to our meetup spot and searched around for people we knew. We were a little dazed. Within a couple of minutes of sitting down, Rebecca, Stacie, and Adrian made their way over. As we chatted, I started to think about the race photos (remember how I told you not to forget about that?) Well! Each time I saw a photographer, I tried to put my best race face forward! There was the mid-stride wave (2 photos). The awkward thumbs-up (2 photos). 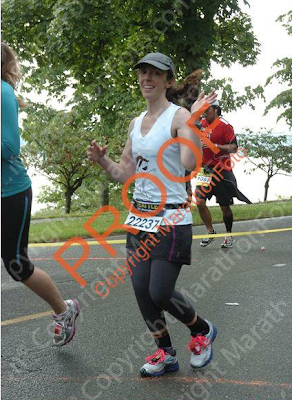 I'm thinking "death warmed over" might actually be the best race look for me after all, especially at $40 a photo. Footnote: If you made it to the end and managed to follow all the digressions and flashbacks within flashbacks, congratulations! You now know how confused you can get while running a race. And yes, I totally meant for this post to be metaphoric like that...Yup. How do people take good race pictures, i.e. not look dead, or like a dork, or like a dead dork? How often in one day, would you say, is too often for jazz hands? EDIT: HANGING OUT WITH YEAH WRITE THIS WEEK AGAIN. CLICK ON THE BUTTON FOR SOME GREAT READS!